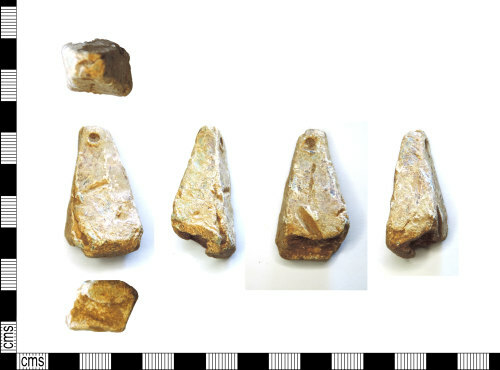 Medieval to post medieval lead alloy standing/pyramidal weight, 39mm long, 19mm wide, 15mm thick and weighs 59.93g. The weight is triangular in form and rectangular in cross section. It has an integral suspension hole near its flattened apex. It is roughly cast and damaged. It is similar to WMID-64ED04 and HAMP-C179D3 which are dated 1200-1600.